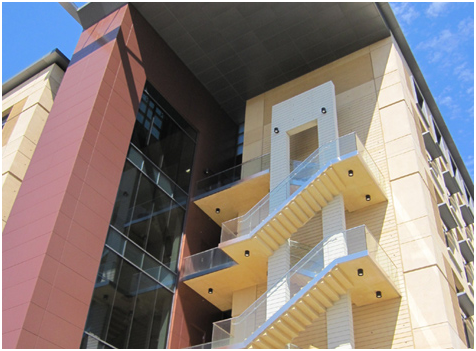 The Clinical Lab Replacement Building (CLRB) is a five-story, poured-in-place concrete building which houses the Medical Center’s Laboratory Facilities for laboratory pathologists and testing specialists. The structural system is based on the preliminary architectural layouts. The poured-in-place concrete structure is comprised of 8” fl at slab concrete floors and 20” square concrete columns providing the bulk of the gravity load resisting system. The on grade floor will consist of a 5” concrete slab supported on compacted fill. Owen's structural team was involved in the coordination of the strutural construction documentation, peer review and construction oversight. This project received the 2012 DBIA Honor Award - Healthcare Facilities at the association's annual conference and expo held in New Orleans, Louisiana.